The 'UK Slot Car Festival' is returning to the British Motor Museum for a weekend showcasing the world of Slot Cars on Saturday 13 & Sunday 14 May. This exciting festival promises to be yet another fantastic family day out featuring Headline Sponsor Scalextric celebrating their 60th Year and other major manufacturers including Carrera, SCX, Slot.it, NSR, Ninco & many more. The festival aims to bring every aspect of the Slot Car world to its audiences including collectors, racers and families. This year there are many new features including a model village rally track, the heat for a new national competition, a slot stunt show and an increase in the display of historic brands including Wren, Playcraft and Minic Motorway. There will be plenty of interactive activities to enjoy, including rally stages, oval banger racing, a drag strip, Ho Scale tracks, digital lay-outs, a massive retail area, trade stands, product launches and a Slot Car Auction on the Sunday. Visitors can also meet the manufacturers and swap, buy and sell cars as well as meet other like-minded enthusiasts, plus play for free on a host of tracks showcasing the very latest innovations such as the - Pro App, controlled racing and Arc Air - wireless hand throttles from Scalextric. There will also be a meet and greet on the Scalextric stand where enthusiasts can discover new and exciting product introductions for 2017. Visitors can also enjoy entry to the Gaydon Spring Classic car gathering outside the Museum on 14 May. Tom Caren, Show Manager at the British Motor Museum said, "Europe's number 1 Slot Car event is always a fantastic hands-on weekend for all the family to enjoy. As well as appealing to slot racers collectors and car fanatics, the festival is a great opportunity for those new to the hobby to get an insight into what it's all about!" 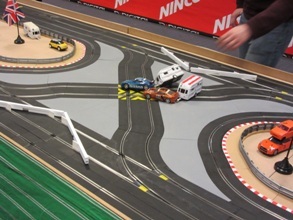 For more information visit the UK Slot Car Festival website at http://www.ukslotcarfestival.co.uk. To find out more about the British Motor Museum please visit http://www.britishmotormuseum.co.uk or call 01926 641188.